President Putin has drawn a line in the mountains of the North Caucasus beyond which Russia will not withdraw. a belief that the Chechens were offered and threw away the chance of responsible independence before. Mr Putin has also added into this complex mix the spectre of international (by which he means Islamic) terrorism and an accusation that unnamed foreign countries want to break bits off Russia. It must also not be forgotten that he has staked his own reputation on his policy and that therefore he is reluctant to change it. The argument is that if Chechnya, a troublesome republic on Russia's southern border, broke away it could provoke demands for independence elsewhere in the region. Chechnya has to its east the Russian republic of Dagestan which is multi-ethnic and where there has been unrest between some of its peoples. To its west is Ingushetia, to which Chechnya was once joined and which is largely Islamic. The Ingush in turn have fought with the North Ossetians who are Orthodox Christians and whose children were the victims in Beslan. And all this is close to the energy-rich Caspian Sea and on Russia's southern flank. The Russian fear is that terrorists have taken over the Chechen opposition and that if Chechnya becomes independent, they will take over Chechnya as well. They might then begin to spread their influence outwards. Mr Putin has alluded to Russian claims that Islamic terrorism is linked to the attack on the school and other incidents. He implies that Islamic terrorism not Chechen nationalism is the real enemy. An oil pipeline from Azerbaijan used to run through Chechnya, but it was by-passed after earlier fighting and now goes through Dagestan. There is oil and gas to be developed in the Caspian Sea and Russia wants a stable area through which to pass supplies. Mr Putin spoke nostalgically in his address to Russia after the Beslan tragedy about the days when the borders of the Soviet Union were protected. He and others regret the loss of so much territory in the break-up of the Soviet Union and want to stop any further territorial erosion. The Russian president argues that after 1997, when then President Yeltsin gave Chechnya autonomy, with independence to be discussed later, the Chechens responded by failing to develop a stable republic. In August 1999, radicals led by the man believed to be behind the school siege, Shamil Basayev, invaded neighbouring Dagestan. Chechens were blamed for blowing up Russian civilian targets, including apartment buildings in Moscow. Mr Putin led the move to re-invade Chechnya. Elections were held there recently so he claims that he has done all he can and that his present policy is therefore one of necessity. Western Russia watchers, like Western governments, have some sympathy for the Russian dilemma but many doubt if Mr Putin's approach is the right one. Professor Margot Light of the London School of Economics said: "Putin does have a geo-political case. It is open to question though whether his chosen means have the slightest likelihood of dealing with the problem. "He has to start talking to the people he says he will not talk to, like Aslan Mashkadov who was the Chechen president until the 99 invasion. "Mr Putin's reputation is on the line. It is extremely useful to argue that this is international terrorism and that outside countries are involved. Frankly this is rubbish. Any involvement by al-Qaeda to train or fund the Chechens post-dates the conflict." Professor Light, however, also suggested that Russian fears of chaos on its border in that region could be exaggerated. "Russia could afford the loss of Chechnya. Talk of other republics leaving the federation is far from the truth," she said. Nicholas Redman, Russia analyst at the Economist Intelligence Unit in London commented: "Oil is an issue but it is not the main issue. If there was oil Russia would still be determined to hang on. "The North Caucasus was a hard-won region and Russia sees itself as a civilising influence there. The loss of other republics in the area, Georgia, Armenia and Azerbaijan, makes it even more important that it should lose no more. "There is a just a fear that if you unravel, where do you stop. "The problem is that Putin's tactics have to be questioned. Russian policy has encouraged divisions among the Chechens and there is nobody who can glue the factions together." 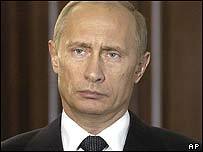 Western governments have not so publicly questioned Mr Putin's policies. Even a hint of criticism by the Dutch government (currently holding the European Union presidency) provoked outrage in Moscow. The West has generally left Moscow to its own devices in Chechnya with occasional and ineffective mutterings about human rights. This is despite a private view among some Western diplomats that Russia, having lost so much of the old Soviet Union, would not be affected by the loss of Chechnya. The reality is that many western governments have their own war against terrorism to fight and do not want to jeopardise Russian cooperation by making adverse comments about Chechnya. It all adds up to a Putin policy of, for the moment, no change. "For many, what matters is not human rights or free speech it is whether Putin will make life safer"